On Saturday, May 19th 2011 a. D. His Excellency, Bishop Czeslow Kozon, Bishop of the Diocese of Copenhagen, Denmark, ordained five seminarians to the diaconate at Our Lady of Guadalupe Seminary in Lincoln, Nebraska for the Priestly Fraternity of Saint Peter. The ordination was held in the newly completed seminary chapel of Sts. Peter and Paul. Deo volente these 5 Deacons will be ordained Priests next year for Holy Mother Church. Please keep these newly ordained Deacons in your prayers as the ascend the Altar of Our Lord. This is a brand new endeavor for Our Lady of Guadalupe Seminary and reflects a partnership with Mr. Doug Barry, founder of RADIX, a Catholic apostolate that began in 1992. Mr. Barry has a 40 bunk indoor facility only 10 miles from Our Lady of Guadalupe Seminary which he is eager to provide as the setting for an altar boy training camp. 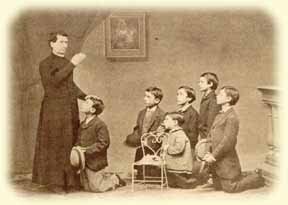 Boys at this camp will be traveling to the seminary almost every day for instruction in serving Mass and keeping a sacristy, as well as making use of the seminary athletic field. Mr. Barry also has a host of professionally developed programs designed to challenge the boys physically and mentally, while imparting valuable lessons in the Faith. Oremus. 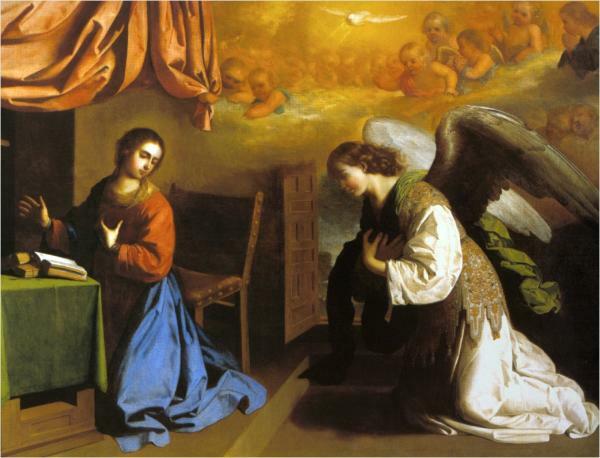 Gratiam tuam, quaesumus, Domine, mentibus nostris infunde; ut, qui, angelo nuntiante, Christi Filii tui incarnationem cognovimus, per passionem ejus et crucem, ad resurrectionis gloriam perducamur. Per eumdem Christum Dominum nostrum. R. Amen. If the Priest is a Saint, his people with be Holy. If the Priest is fair, his people will be mediocre. If the Priest is mediocre, his people will be bad. 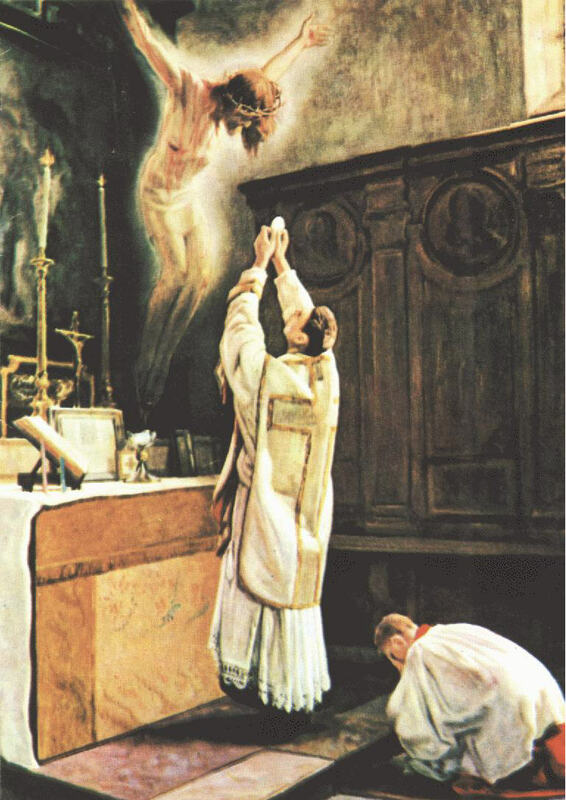 Please pray for your Priest! 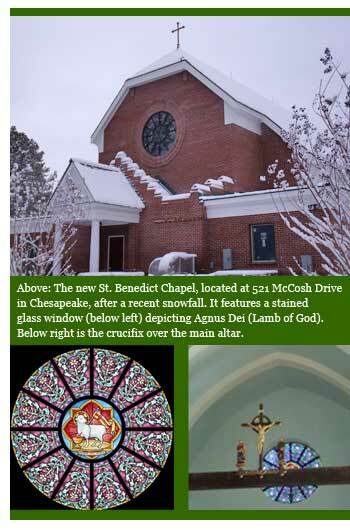 The new church of St. Benedict Chapel in Chesapeake will be blessed and dedicated on Saturday, March 5, by Bishop Francis X. DiLorenzo at 10:00 a.m.
Father Neal Nichols, chaplain, will be the main celebrant of Mass according to the Liturgical Book of 1962 Latin Mass (Tridentine Latin Mass) immediately following. Built at a cost of $2.5 million, the new chapel was designed by Franck & Lohsen Architects of Washington, D.C., a firm which specializes in Catholic church architecture. Design Architect Michael Franck says the chapel has Roman arches, circular windows at the choir and sanctuary, and brick detailing at the parapet and niche. All elements echo the historical, local vernacular of architecture dating back over 200 years. Upon entering the chapel, which seats 300, parishioners encounter a small, monochromatically painted narthex which then leads to an expansive, high-vaulted and richly decorated nave. New stained glass windows share the walls with antique Stations of the Cross. Highly detailed millwork in the nave honors the neoclassical detailing traditionally found in Tidewater churches. A hint of gothic architecture at the choir and at the sanctuary forms a backdrop for an antique high altar and side altars, as well as an antique marble communion rail. High atop a rood beam rests an antique crucifixion scene illuminated from a new stained glass rose window. 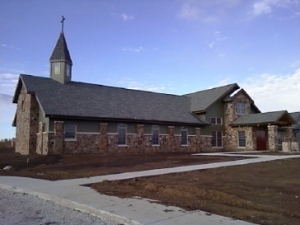 The chapel of St. Benedict started in September 1991 with only 90 parishioners. Worshipping in a small farmhouse-converted chapel, the parish has grown to over 400 members, with the average age of parishioners in their late 20s with many young families. As the parish increased, it quickly outgrew the worship space, and the faithful approached Bishop DiLorenzo for permission to build a new chapel. Many of the architectural and planning details were developed by Father Kevin Willis, the first priest assigned by the Priestly Fraternity of St. Peter as Chaplain to St. Benedict in February of 2006, in collaboration with Dr. Denis McNamara, Architectural Historian at Mundelein Seminary, and liturgical consultant on the project. In addition to Father Neal Nichols, St. Benedict Chapel is also staffed by Father Peter Byrne of the Priestly Fraternity of St. Peter. Thanks to The Catholic Virginian for the article.